It’s the first day of cooking in Alinea's Food Lab and the mood is relaxed. We’re in a residential kitchen but there’s nothing ordinary about it. Chef Grant, along with sous chefs John Peters and Curtis Duffy are setting up. The sight of the 3 steady pros, each in their chef’s whites, working away, does not match this domestic space. Nor does the intimidating display of industrial tools lined up on the counters. While the traditional elements are here in this suburban kitchen: oven, cooktop, sink, so too are the tools of modern restaurant cookery: pacojet, cryovac machine, paint stripping heat gun…wait, a paint stripping heat gun? In the physical realm, the Food Lab is a tangible space where the conventional and the unconventional are melded together in the quest for new culinary territory. With Alinea’s construction under way, the team must be resourceful. This meant that renting a space large enough to house both the office and the kitchen aspects of the food lab was out of the question. The decision was made to take over a large office space for the research and administrative aspects of Alinea and transform a residential kitchen into the Lab. 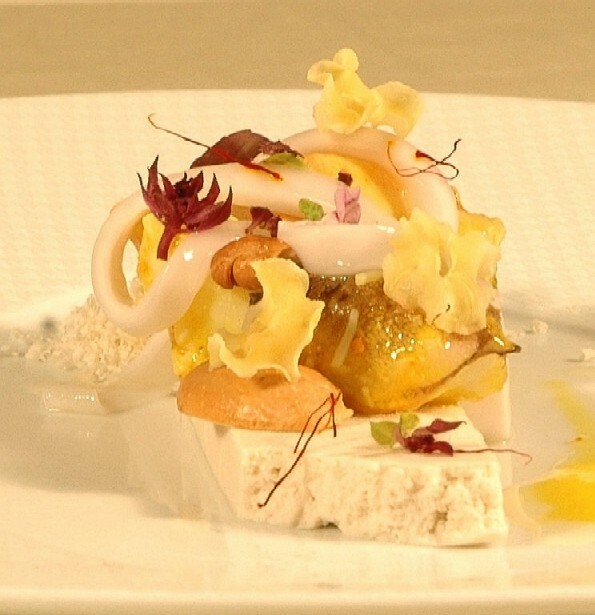 Achatz and the team would work three days per week at the office researching all aspects of gastronomy and brainstorming new dishes, while managing the project as a whole. 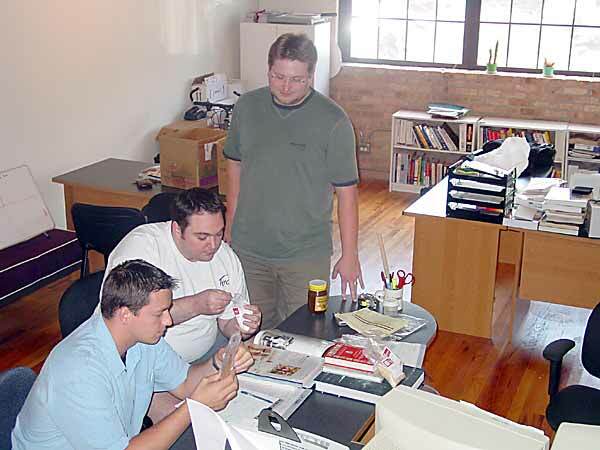 The remaining time would be spent in the kitchen executing the ideas formulated at the office. “At first I thought separating the two would be problematic,” says Grant “but in the end we are finding it very productive. It allows us to really focus on the tasks at hand, and also immerse ourselves in the environment conducive to each discipline.” The menus for opening night—containing as many as 50 never-before-served dishes--must be conceived, designed, tested and perfected. The Alinea team does not want to fly without a net on opening night. On a more abstract level, the Food Lab is simply the series of processes that continually loop in the minds of Chef Grant and his team. While there is no single conduit by which prospective menus--and the dishes which comprise them--arrive at Alinea, virtually all of them start in Chef Grant's imagination and eventually take form after brainstorming sessions between the Chef and his team. Menus are charted, based on the seasonality of their respective components, and the details of each dish are then laid out on paper, computer or both and brought to the kitchen for development. 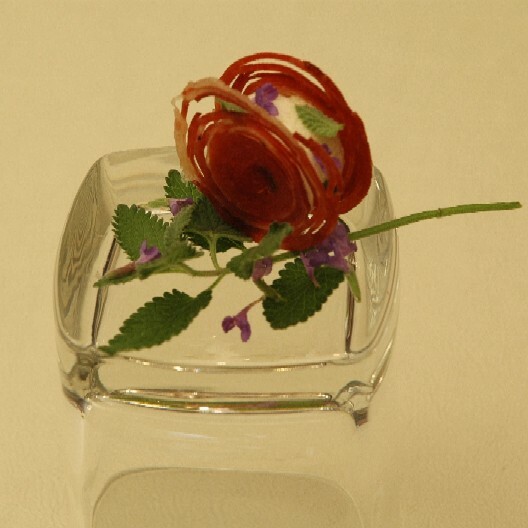 In this regard, the Food Lab provides something very special to the Chef and his team. “We consider the food lab a luxury,” says Grant. Once Alinea is open and the restaurant’s daily operations are consuming up to 16 hours of each day, time for such creative planning (aka play) will be scarce. Building a library of concepts, ideas and plans for future menus now will be extraordinarily valuable in the future. Otherwise, such planning sessions will have to take place in the 17th and 18th hours of future workdays, as they did when the Chef and his team were at Trio. The steps required to comprise each dish are, as one might imagine, intricate and numerous. For the Poached Broccoli Stem, Chef Grant begins by separating the broccoli stems from the florets. 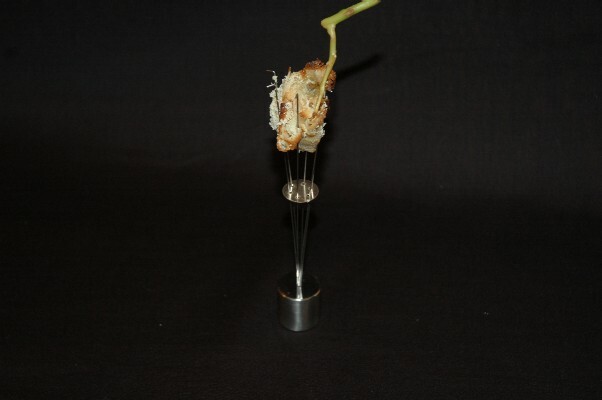 The stems are stripped of their fibrous exteriors and pared down until they are uniform in size. Grant comments on the use of the second hand part of the vegetable: “This dish started with the roe. Every year we receive the most amazing Brook Trout Roe from Steve Stallard, my friend and owner of Blis. Typically, we serve the eggs with an element of sweetness. I find it goes very well with the ultra fresh salinity of the week-old roe. This time around we wanted to take a savory approach so I began looking into complimenting flavors in the vegetal category. About the same time, our group had a discussion about secondary parts of vegetables and the stem of broccoli came up. I had a past experience with the stem and found it to be very reminiscent of cabbage. Knowing that cabbage and caviar are essentially a classic pairing, I felt confident that we could work the dish out. Now I'm struggling to decide if this is a broccoli dish or in fact a roe dish, I think they really battle for the top position and that helps makes the dish very complex." 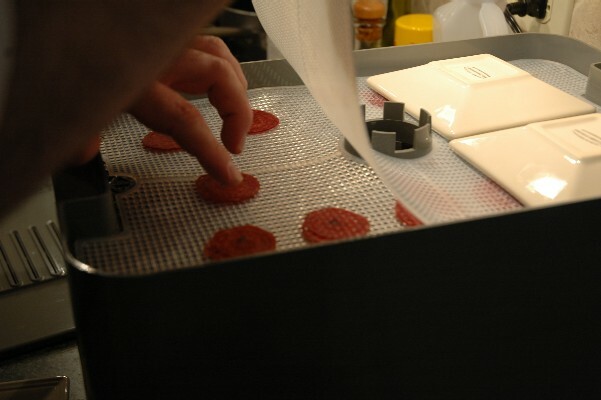 The crisp bread element is fabricated via the use of an industrial deli slicer. Chef Grant then brushes the sectioned pieces of poached broccoli stem with eggwash, affixes them to the thin planks of brioche and places them in a fry pan with butter. 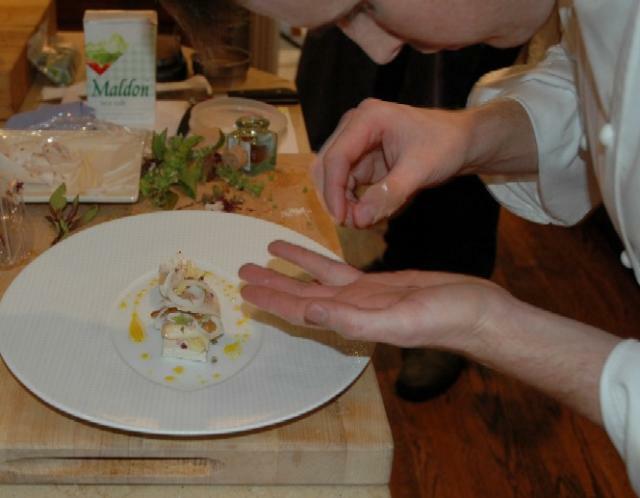 Chef Grant ponders one potential plating of the dish. He called this incarnation 'predictable' and started over. The thought for the dried crème brulee originated over a year ago when a regular customer jokingly asked for a crème brulee for dessert. “He said it as joke, I took it as a challenge,” says Grant. "Of course, we never intended to give him a regular crème brulee.” The team tried various techniques to create the powder-filled caramel bubble while at Trio to no avail. 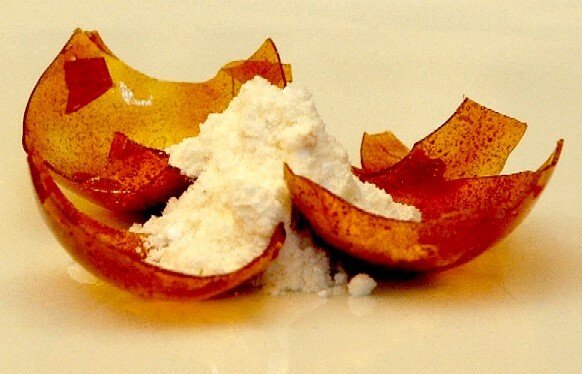 An acceptable filling for the Dried Crème Brulee has been developed by the Chef and his team but several different methods, attempted today, to create the orb from caramelized sugar have been less than 100% successful. Chef Grant’s initial idea to use a metal bubble ring and heat gun (normally used for stripping paint) to form the bubbles does not work as hoped. Attempts to fashion them by hand also come up short. Says Grant, “At Trio we tried a hair-dryer. When Martin told me about these heat guns which get up to 900 degrees F, I thought we had it for sure. 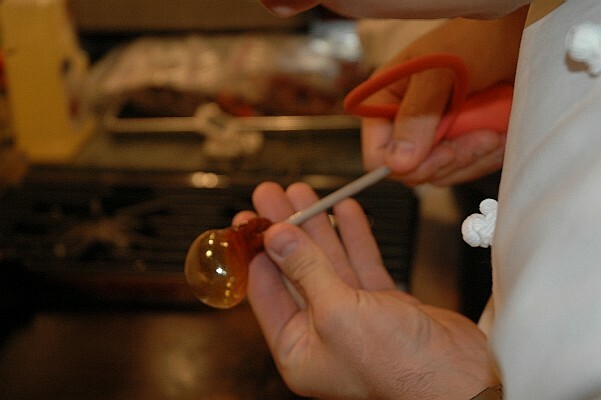 If it was easy everyone would do it I guess.” Eventually, Alinea partner Nick Kokonas garners the task’s best result by positioning a small, warm blob of sugar onto the end of a drinking straw and blowing into the other end. The results are promising. Curtis suggests using a sugar pump to inflate the orbs. That adjustment will be attempted on another day. “We intentionally position whimsical bite in the amuse slot, it tends to break the ice and make people laugh. It is a deliberate attempt to craft the experience by positioning the courses in a very pre-meditated order. A great deal of thought goes into the order of the courses, a misalignment may really take away from the meal as a whole.” For PB&J, the grapes are peeled while still on the vine and then dipped into unsweetened peanut butter. They are allowed to set–up, and then they are wrapped with a thin sheet of bread and lightly toasted. When the peeled grapes warm, they become so soft they mimic jelly. The composition is strangely unfamiliar in appearance but instantly reminiscent on the palate. PB&J is, according to Grant, virtually ready for service. There are a couple of aesthetic elements, which need minor tweaks but the Chef feels very good about today’s prototype. Often, creative impulses come by way of Alinea’s special purveyors. “Terra Spice’s support over the past couple of years has been unprecedented, and it has accelerated with the start of the food lab,” says Grant. “It is great to have relationships with people that think like we do, it can make the creative process so much easier. Often Phil, our contact at Terra, would come into the kitchen at Trio and encourage us to try and stump him on obscure ingredients. We always lost, but not from lack of trying. 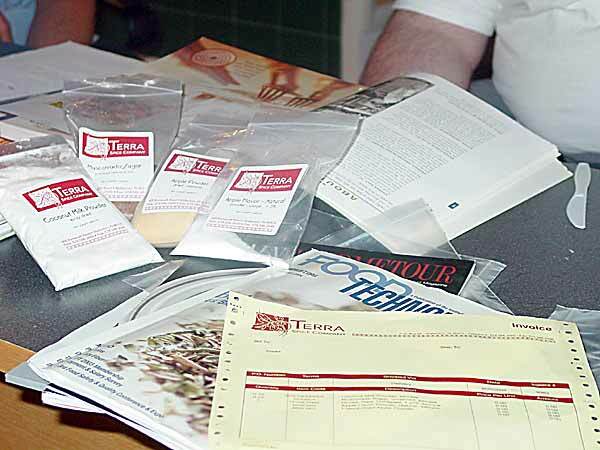 He even brought in two live chufa plants into the kitchen one day.” The relationship has developed and Terra team has really made an effort to not only search out products that the chefs ask for but also keep an eye out for new ingredients and innovations. In August, Phil brought by some samples of products that he thought the Alinea team might be interested in trying. Grant recalls “the most surprising item to me was the dried coconut powder. When I put a spoonful in my mouth I could not believe the intense flavor and instant creamy texture, it was awesome.” That was the inspiration for what is now Instant Tropical Pudding. 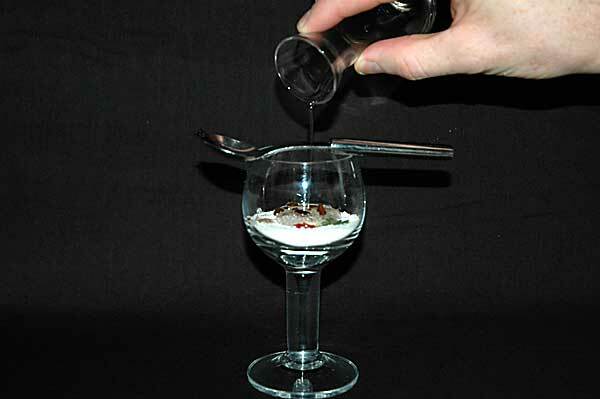 The guest is presented with a glass filled with dried ingredients. A member of the service team pours a measured amount of coconut water into the glass and instructs the guest to stir the pudding until a creamy consistency is formed. At the end of the day, the Chefs assess their overall effort as having gone “fairly well.” It’s a mixed bag of results. Clearly, the fact that things have not gone perfectly on Day 1 has not dampened anyone’s spirits. The team has purposely attempted dishes of varying degrees of difficultly in order to maximize their productivity. 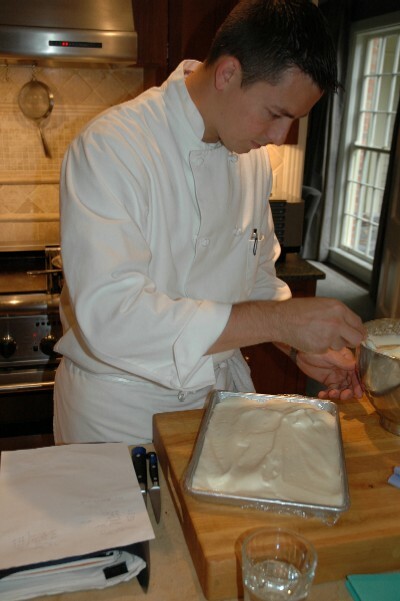 Says Grant, “Making a bubble of caramel filled with powder…I have devoted the better part of fifteen years to this craft, I have trained with the best chefs alive. I have a good grasp of known technique. The lab's purpose is to create technique based on our vision. Sometimes we will succeed, and sometimes we will fail, but trying is what make us who we are." The team's measured evaluations of their day’s work reflect that philosophy. According to Chef Grant, “The purpose of the lab is to create the un-creatable. I know the level at which we can cook. I know the level of technique we already possess. What I am interested in is what we don't know...making a daydream reality.” With little more than 100 days on the calendar between now and Alinea’s opening, the Chef and his team will have their work cut out for them. Whatss the story on the PB and J thing, it looked interesting. What was the inspiration for your version of PB&J? As I said up-post that amuse slot is an important one. The guests first bite should, in my opinion, do more than just taste good. For us it becomes a way to disarm the diner. Yes the food is highly manipulated, yes it is aesthetically different that most that you have had, yes it tastes good, but it is also familiar and it is ok if it makes fun of itself. If we can successfully place a dish in front of the guest that is visually unfamiliar yet tastes of one of the most comforting flavors known….. we have successfully set the tone for the rest of the evening. The dish itself it very simple. The technique of slicing bread very thinly and wrapping it around things comes from el Bulli. The inspiration for this particular dish started with the squid. That is what we call the holder developed by Crucial Detail. I wanted a bite sized course that would be consumed by hand and be positioned upright. I started to review fruits and vegetables that would provide a natural “handle” for the guests to use to consume the course. Once I settled on grapes on the vine the rest was a given. Of course we make the peanut butter ourselves and peel the grapes while they are still on the vine, that takes some dexterity. Can you give us an update on the Dried Creme Brulee? Has your crew been able to "push the ball forward," so to speak? Fabulous report about an extremely exciting project. ChefG, I have a question about the sous vide cooking of the broccoli. It appears in the photo as if you are cooking it in water on top of a range. How do you control the temperature to a constant 170F or do you? Another question - I do not see the broccoli stems in the final platings. Are they there? I think I can answer this part of the question. 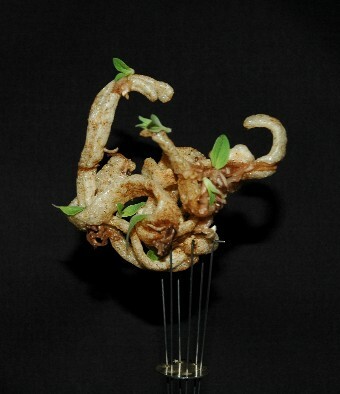 The crisp breads are inverted, with the broccoli stems on their undersides, facing the plate. Ok, I can see that in the first two platings, but not in the final plating with the disc shaped bread. That appears to be resting flat on the bottom of the plate, although I suppose it isn't. It is an intriguing dish. Personally, the stems are my favorite part of the broccoli. If I am not mistaken, that is a bowl, so the broccoli stem is underneath the bread. If you look very closely, it appears that the crisp bread disc is not lying completely flat on the plate in the final version shown. I love the stems too. I often make slaw or soup with them. 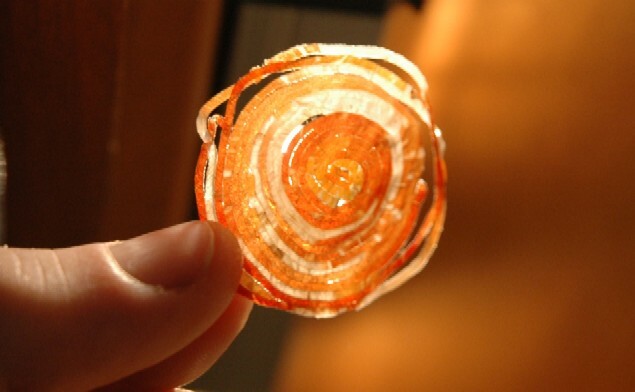 We have in fact finalized the technique that we will use to create the bubble of caramel. After tomarrow's session I hope to be able to post some images. Most excellent. I'll look forward to seeing them. uhhh...so WHEN are you going to start taking resumes? With every post I become more anxious. LOL...again with the resume questions?! Please check Alinea's web site for employment information. eh, there's still only the intro page there. I figure that I might as well keep popping my face out into the open. I know it is a bit like when I applied to Harvard, but then again, I won't know what I am capable of if I rely solely on speculation. Even a stage position would be like my Golden Ticket, but an actual paid position, now that would be incredible. I will venture so far as to say that I believe Alinea will be one of the most important restaurants in America for years to come. I appreciate your enthusiasm and perseverance. There is an email link that appears at the bottom (right corner) of the intro page at the Alinea site. From what I can tell, it appears to be functional. This is, by far, the coolest thing I have seen yet on eGullet. I look forward to coming to Alinea now as much as look forward to Masa or even The French Laundy. I cannot thank you enough for letting us have this look into the process behind your food. It really is quite incredible. this is amazing, thank you so much for the report. also very interested to hear about the brulée. what will the dessert feel like in the mouth? aside from its flavor, will the traditional crème aspect of the dish come through? At the risk of starting a flood, I will say that nothing is stopping you from sending your request for information or resume to info@alinearestaurant.com . A "few" others have already... Every single email gets personal attention. Officially, the next phase of our website will likely go live in December. It is likely then that Chef Achatz will begin sorting through all of the employment requests. There is an electronic thermometer probe that you can see sticking out of the right hand side of the pot. The temperature is monitored and a slow steady flame keeps it very constant. With a large pot of water, this is easy to achieve. In each of the platings, including the final one which is a bowl, the broccoli stems are under the brioche. ... and don't worry Chef G and eGulleters, that is the first, last, and only food question I will answer! The most amazing media, I have ever seen, in any form. If one could parallel your artistry, it would be to Paul McCartney writing " Hey Jude" for Juilan Lennon. A fascinating process to witness. I have to say this is probably the most exciting section of eGullet at the moment! Reading about all the developments for Alinea has made me feel vicariously exhilarated about it. ChefG: All the best and hope to see how the dried creme brulee turns out! At this point we have been is the test kitchen for about 7 weeks. It took some time to get acclimated to the mechanics of a kitchen after a four-week absence, but now it seems the team has hit a groove. We are adjusting to our surroundings and getting used to the schedule that we have held over the last two months…now things seem to be developing as we envisioned. One aspect of this process that I have found most interesting is the relationship between the actual foodstuffs and creation of concepts. In the past, while working 16 hours a day, I always wished for more quiet time to “brainstorm”. I felt that if I slightly removed myself from the maintenance of daily production it would enable me to conceptualize dishes more efficiently, freeing up more time to ponder technique, and craft the overall experience that would become Alinea. Recently, I have had the time, and that is not true. Hours spent in front of a computer, in cookbooks, and with my eyes closed result in fewer ideas than when I touch the food. I will have a preconceived idea of a dish’s direction, or of the aesthetic, and it will change before my eyes when I touch the ingredients. At this point I will walk you through some of the dishes we have been working on. Ron captured the early struggles of the caramel bubble. As I mentioned this concept has been in the back of my mind for a long time, only recently have we devoted a great deal of time to the development. We were determined to “blow” a bubble of caramel, in the literal sense. This thought obviously stemmed from the basic concept of a bubble, as we knew it, the introduction of forced air into an elastic medium. Our determination became a limiting factor, when in fact we knew the technique that would solve the problem all along. It took Nick's wife, Dagmara, who was quietly watching us struggle, to bring the solution to life. We had used balloons to help us mold food into spherical shapes before. 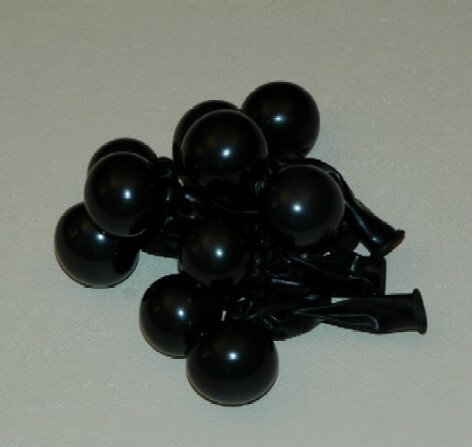 In the past we used them in the inverse, filling the balloons with the liquid foodstuff and popping the balloon to achieve the shape we desired. In this case the balloon had to become an exterior mold, the balloon dipped into the hot sugar and then deflated to produce the brittle shell. After several popped balloons and some burned fingers we finalize the technique and the result is shown here. As I stated we were determined to produce a dried crème brulee. After the burnt sugar sphere was created the rest seemed easy. 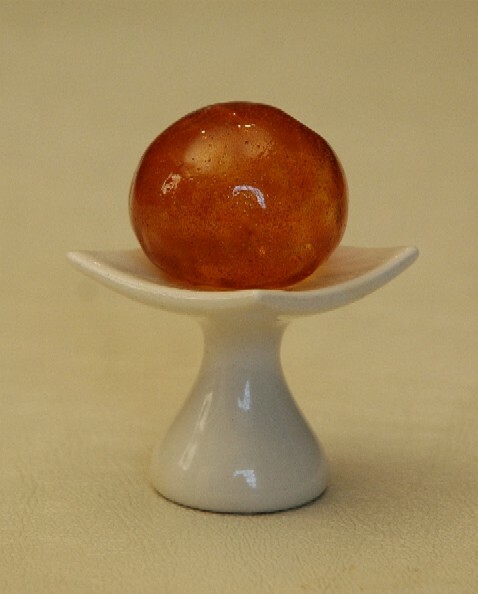 A mixture of spray dried cream, egg yolk, and powdered sugar scented with vanilla was mixed and added to the orb. A bottom layer of sugar was added and the result was a globe of caramel with a powdered “custard” interior. In true ironic innovative fashion we looked at the November issue of Food and Wine today and read about Jose Andres producing a “caramel lightbulb”…after some disbelief and a few four letter words we came to the conclusion that we ran out of time for this concept. In todays fast paced world you need to get your ideas to the table very quickly, every pun imaginable intended. I love coconut. We only deal with it fresh of course, and it becomes one of the “bottom of totem pole” tasks in the kitchen, that is, to shuck, peel and juice the flesh. The end result is far superior than any processed product you can buy, not to mention the sense of accomplishment that comes with fabricating a dozen or more, with the knowledge that the will be consumed that night. For this dish: Stone Crab young coconut, cashew, parsnip we decided to utilize modern technology to help us achieve the desired effect. Parsnips have an amazing aromatic quality when raw, but seem to be very toothsome at that stage. After we settled on the flavors of cashews and coconut to solidify this crab dish we were determined to produce a veletely eretheral puree made from those ingredients. The first couple of attempts fell short, the puree coming out very grainy. But after marinating the raw cashews, young coconut, and parsnips overnight in a solution of coconut water and salt we discovered the mixture cold be manipulated into a smooth puree in the vita-prep blender with ease. At that point we froze the puree and processed it in the paco jet, the result was a mousse like consistency of ultra-smooth texture. This base became the sockel for the resulting crab dish. In an attempt to build on the aromatic quality of the dish we looked to volatile spices to accent the crisp raw flavors of the puree. Mace and saffron seemed a natural match. 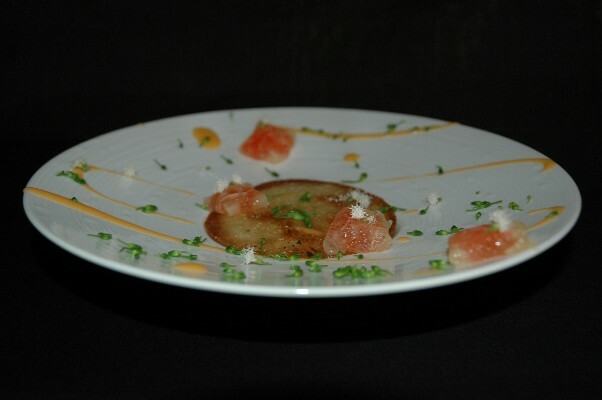 The result was vinaigrette made from the two spices; it would be tossed over the crab and applied to the plate. The last element was the herbacious kilimanjari basil which you see in leaf and bloom form. This dish was initialized from the dehydration of cured meats. Their intensely salty and crispy characteristics were appealing to us, especially since the use of a dehydrator produced a result that did not taste “cooked”. It seems to be the closest version of a crispy “raw” flavor that we can accomplish. I considered using pancetta in this manner, mainly for its rolled properties, but found the flavors of procuitto to be more appealing. Trying to mimic the spiral asthetic of pancetta we rolled the thinly sliced procuitto and froze it into a log. It was then sliced into thin rounds and dehydrated into crispy, half dollar sized chips of cured meat. Of course everyone would think of melon at this point. But the reason melon works so well with procuitto is what interested me. Knowing we could replace it with anything that fit the profile, we chose passionfruit for a few reasons. Obviously the fruitiness, but also the intense aroma and acidity. The pulp and shell were made into a broth that was then turned into a bavarios. This was punched into a disc slightly smaller than the ham and sandwiched between. Mint seemed to be another natural element to this dish. We chose catmint that was growing in Nick’s garden. It is very powerful and tends to push into nose more them most mints. I think it is nice contrast to the lingering meaty notes of the ham. We view responsible manipulation as a good thing. If we can maintain integral qualities of an ingredient but present it in a different form, be it an alteration of texture or physical state, that is appealing to us. This is an example of that philosophy. Here we have flavored a “cracker base” with a duxelle of wild mushrooms and various mushroom powders. The apperiel is mixed, steamed, dehydrated, and then fried to achieve its final form. The result is a very crunchy, intensely flavored mushroom cheetos if you will. 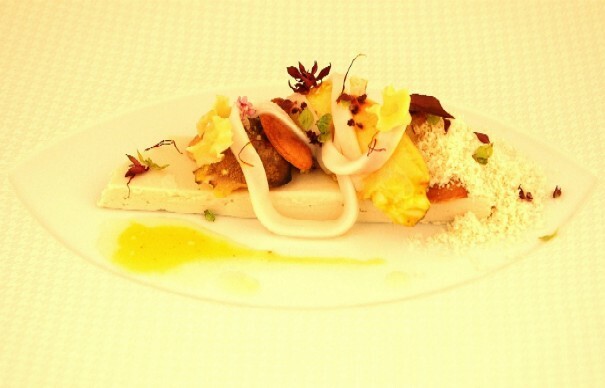 We simply micro-plane fresh matsutakes mushrooms over the cracker and arrange various herbs throughout. The dishes as you see them here will undoubtedly evolve of the next couple of weeks. I am sure by tomorrow morning we will all have fresh ideas regarding them, and as more days in the kitchen unfold the dishes will mature. After all, that is one of the main reasons we decided to devote the energies to this process, to open Alinea with dishes that have gone through the same evolutionary process as a restaurant that as been open for a period of time. I am finding it difficult to articulate the physical process behind a lot of these concepts. I can comment on the inspiration, and the technical aspects, but the fact that they are so close to me prevents me from describing them objectively. Maybe Nick can give us an "outsiders" opinion.